Nikoways’ talent pool of mobile app developers includes highly-skilled analysts, UX experts, and software engineers who are well-versed in building apps for all the major platforms — whether it's iOS, Android, or Windows Phone. Apps can be developed natively, or by using cross-platform frameworks and platforms such as PhoneGap. Our developers have in-depth knowledge of major platforms or frameworks used for mobile app development. 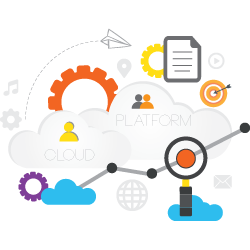 Cloud apps can provide fast responsiveness and have become popular among people who share content on the Internet. Like web apps, cloud apps need not permanently reside on the local device, but they can be easily updated online. Developing and deploying applications on the cloud requires careful assessment and planning for security, scalability, capacity, and integration with other on-premise or cloud applications. Highly scalable software application development is a core part of our activities. We offer innovative solutions to our clients and meet their software needs using PHP 5, ASP, .NET, JSP, J2EE, Java, Voice XML, XML-HTTP messaging and AJAX technologies with MySQL, MS SQL, Oracle and MS ACCESS as databases. Our expertise includes developing applications using Content Management Systems such as Joomla and WordPress. We offer solutions for integrating new or existing systems with front and back-office applications. We implement cutting edge JAVA based applications including J2EE, J2ME applications etc. with multi-tier architecture platforms like Struts, Spring, Hibernate etc. and develop Web 2.0 services and other futuristic applications. A website is the first and most important point of interaction between you and the visitor in the digital sphere. Nikoways will ensure that this interaction leaves a positive impact on the customer and build a brand image in the minds of the customers through proper engagement. Nikoways have creative as well as technical expertise to design a responsive website with engaging content. We ensure that the project undertaken is in compliance with the W3C standards of accessibility. Some of the open source content management systems we customize are Magento, Joomla, WordPress, and Drupal.